How many times have you send a partially composed mail or missed to attach a required document and realized after couple seconds that that you clicked on Send button by mistake? Almost all the email users would have come across this type of embarrassing situations at least once. Microsoft Outlook has a nice feature which allows email users to recover from this type of mistakes and take appropriate actions to rectify them. 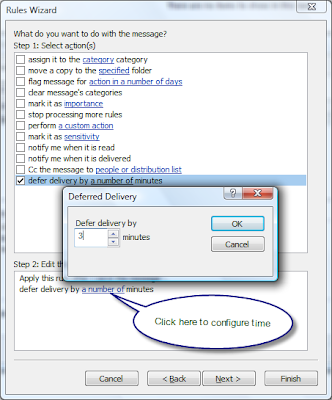 Using a "Defer" rule in Microsoft Outlook we can pause all the mail delivery for few minutes after clicking the Send button. If we realize the mistake in the mail before the deferred time we can correct it and prevent an embarrassing situation. Click on the Next again to skip the wizard step "Which condition(s) do you want to check?" 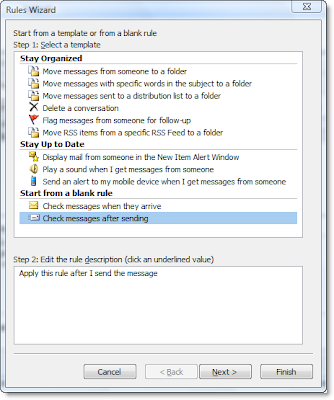 and a message box will be prompted with text "This rule will be applied to every message you send. Is this correct?". Select Yes. On the next screen choose the option "defer delivery by a number of minutes", and then click on "a number of" and change the defer minutes to 3 minutes (when I tested I found 3 minutes as a good time to realize mistakes. You can adjust this value to whatever you would like to) and click on next . Again click on Next button to skip the wizard step "Are there any exceptions?" and give a name to this rule. Specify any name of your choice and click on Finish to complete the rule definition. Heard about good tool which works with outlook files-fix corrupt pst,program is free,it can restore either your mailbox or the whole system in minutes,can easily repair your mailbox, no need to waste your time and prepare backup copies, that should be updated regularly,analyze your mailbox for errors and extract all emails, contacts and attachments, if necessary,works with all supported versions of Microsoft Windows operating system and Microsoft Outlook email client,will display it automatically, when this Outlook pst fix program is launched, it happens, when current user has only one default profile,can help you to find all files with *.ost and *.pst formats, that are located on your HDD,extract separate files, that can be opened even without email client, this tool supports *.eml, *.txt and *.vcf formats. A lot of people advised me this tool-how to open ost in outlook 2003,as how as I remember program is free,it open ost file in Outlook 2003 and recover your data from these encrypted *.ost files,it allows to move *.ost files to *.pst ones fast and easy,it has two recovery options, first of all, you can move your *.ost file to a *.pst file, the last one can be easily opened by Microsoft Outlook or any other compatible email client.